More than any other area of late-twentieth-century thinking, gender theory and its avatars have been to a large extent a Franco-American invention. 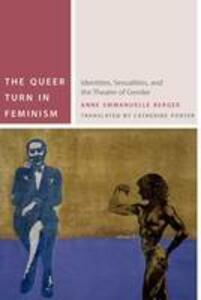 In this book, a leading Franco-American scholar traces differences and intersections in the development of gender and queer theories on both sides of the Atlantic. Looking at these theories through lenses that are both "American" and "French," thus simultaneously retrospective and anticipatory, she tries to account for their alleged exhaustion and currency on the two sides of the Atlantic. The book is divided into four parts. In the first, the author examines two specifically "American" features of gender theories since their earliest formulations: on the one hand, an emphasis on the theatricality of gender (from John Money's early characterization of gender as "role playing" to Judith Butler's appropriation of Esther Newton's work on drag queens); on the other, the early adoption of a "queer" perspective on gender issues. In the second part, the author reflects on a shift in the rhetoric concerning sexual minorities and politics that is prevalent today. Noting a shift from efforts by oppressed or marginalized segments of the population to make themselves "heard" to an emphasis on rendering themselves "visible," she demonstrates the formative role of the American civil rights movement in this new drive to visibility. The third part deals with the travels back and forth across the Atlantic of "sexual difference," ever since its elevation to the status of quasi-concept by psychoanalysis. Tracing the "queering" of sexual difference, the author reflects on both the modalities and the effects of this development. The last section addresses the vexing relationship between Western feminism and capitalism. Without trying either to commend or to decry this relationship, the author shows its long-lasting political and cultural effects on current feminist and postfeminist struggles and discourses. To that end, she focuses on one of the intense debates within feminist and postfeminist circles, the controversy over prostitution.